In Hauz Khas Village with its hip & happening crowd, I found this unique outlet called NIICE CREAM which is a comfortable 10 seater ice-cream parlour with upbeat rock music playing. As I entered the parlour I felt so relaxed & chilled out as if I was in a cool chilly place like Swiss Alps or Scotland. 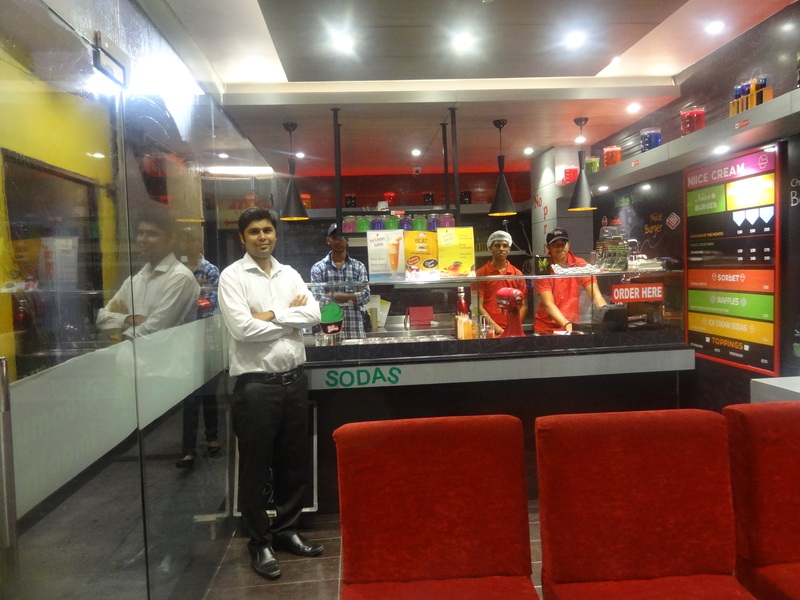 It’s a London concept that they have brought in India & believe me their ice creams are superb. They have standard flavours like Mango, Strawberry, coffee & premium flavours like caramel, blueberry cheesecake & nutella. Along with the ice creams, they also have standard add-ons like white choco chips, oreo orange, butterscotch chips, tutti fruity, toffee sauce & the premium add-ons like brownies, after eight, Kit Kat, peanut butter & chocolate fudge. There is also the option of taking the sweet creamy base or the sugar free (sugar less) in ice creams. I started with the Nutella Niice Cream. 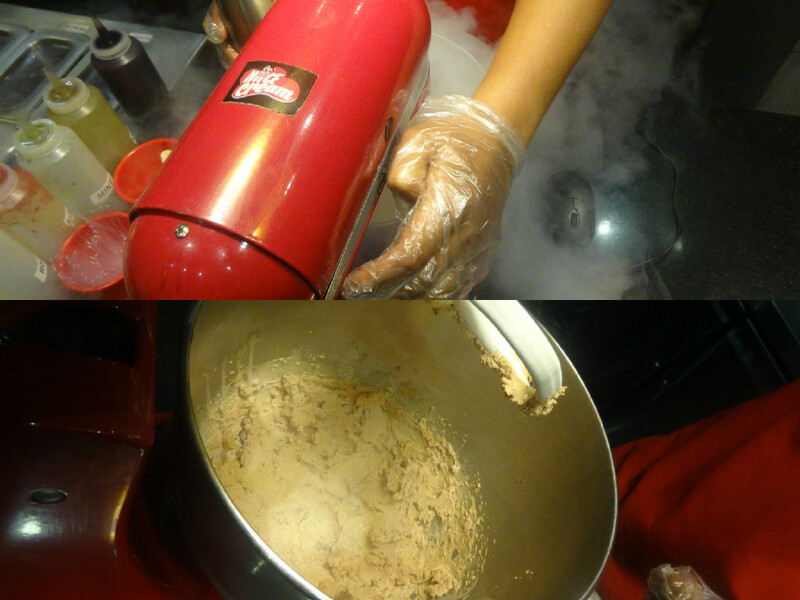 They made it in front of us by mixing the creamy ice-cream with liquid nitrogen used for freezing the ice-cream. 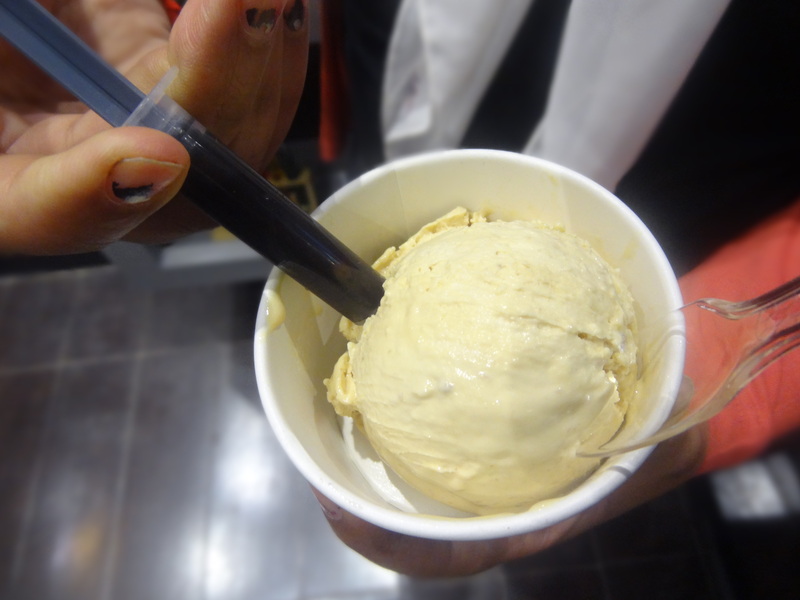 Then the ice cream is scooped in a cup & it’s injected with an injection (chocolate syrup). We inject it in the ice cream and then the ice cream became more delicious & chocolatey. They introduce a new flavour every month but this month it was the BANOFEE PIE. I think after Baskin Robbins, the only flavours I love & adore is here. This Banoffee pie is made of banana & pie with lots of toffee sauce. 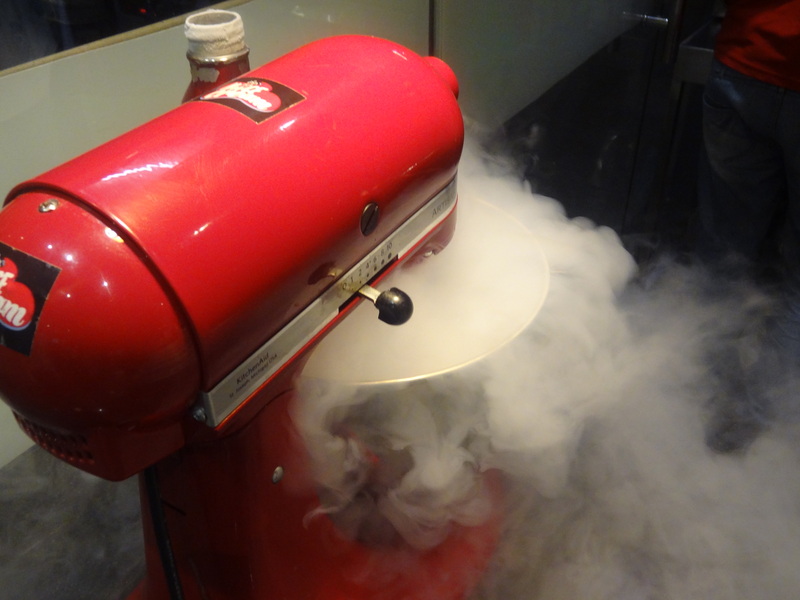 The Banofee Pie ice cream is basically a mix of banana & caramel flavour & blended in the machine with liquid nitrogen which is released in the cream blend. It evaporates & is not harmful in intake (just used for freezing the ice-cream) with a chocolate injection provided in it (3 mL to quantify the chocolate serum) which is then injected deep in the caramel ice cream. It was very tempting to taste. 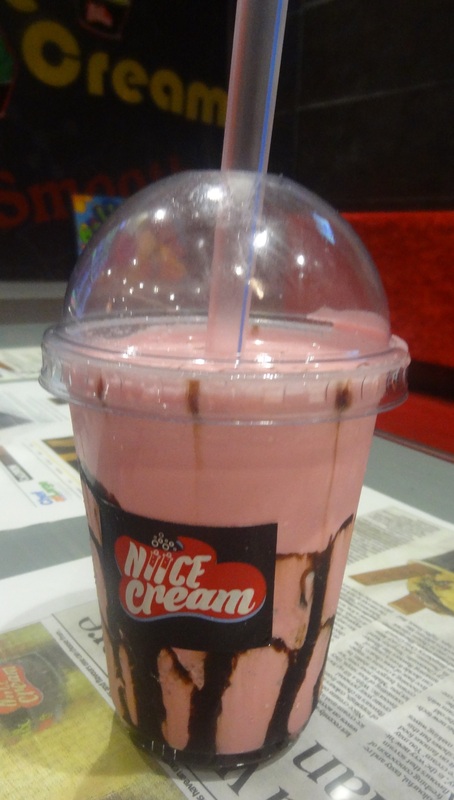 I also tasted their shakes known as Niice Shakes which are available in variety of flavours like vanilla, mango, strawberry, coffee, peach, Belgium chocolate, mint & rose. 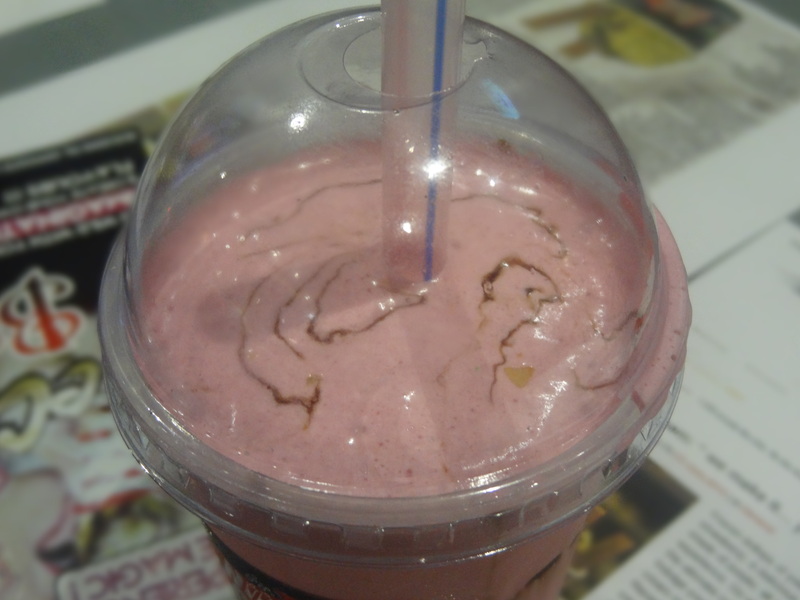 I ordered the Vanilla shake with Butterscotch chips & gems as toppings & also chose red colour for it. This can also be done to the ice creams as well & it does not change the flavour. It was really yummy & nutritious, milky & sinfully tasty. It looked so amazing & appealing & the shake was totally a delight with the chunky pieces of butterscotch & gems gritting in my mouth making crackle sound. A must try for vanilla lovers- a treat! 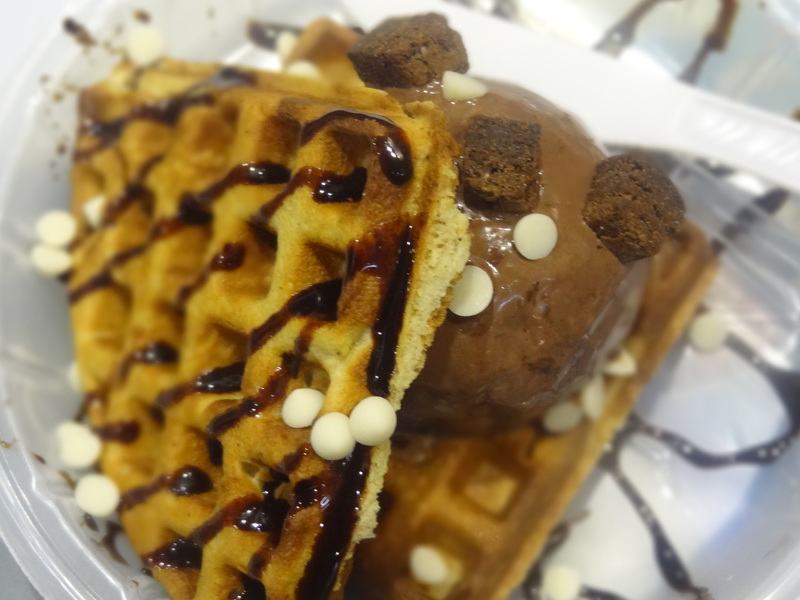 Next I had the Niice burger there which was a waffle made with milk & eggs with an ice-cream in between. The waffle was very nice & crisp and baked fresh right in front of us. It tasted perfect with the ice cream. I selected the premium flavour Ferrero Rocher along with white choco chips & choco brownies. It was a fun experience, dipping, dropping, melting & eating. The place is lovely & colourful. 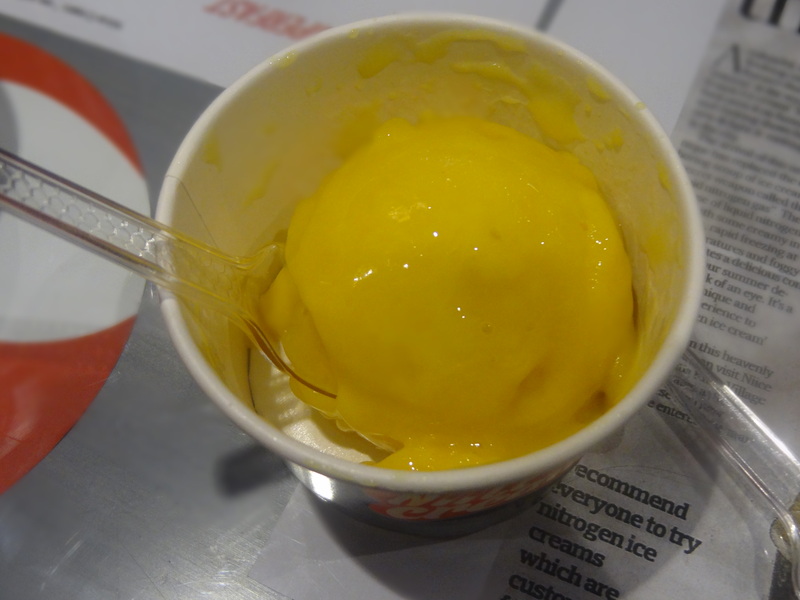 I also tasted the lovely yummy mango sorbet which looked like a frozen ice berg of ice in sunny yellow colour. It was really cold & yummy plus it had a strong mango flavour which tasted delicious. I committed the mango sin. The interiors of the parlour are very foreign style, neat & clean with freezing temperatures & good machines. All the stuff I tried there were amazingly good & rockingly temptilicious sinful. It’s one of the most recommended ice cream joint of the town.